I’ve only been to Cross Plains three times but I’ve fallen under the spell of this historic little town. It’s a place Robert E. Howard called home, and while I don’t live there whenever I visit I quickly feel like I belong. Perhaps this is due to the friendliness of the fans and the scholars; it’s great to discuss literature with people who share some of the same feelings I have for writers such as Howard, Lovecraft, Clark Ashton Smith and others of the Weird Tales talent parade. But that’s not the whole story. While my admiration for Howard has been a part of my life since I was about eleven, my obsession with Cross Plains clearly started on my second visit, in 2007. During my first visit, in 1967, I stayed for only a few hours, but this second time I was there for days, and the town left a lasting impression. I’ve been a collector of Howard since about 1966, but upon returning home in 2007 I also became a collector of all things Cross Plains. Well, perhaps, not all things, but any item that has a little age to it will find a welcome place in my library. I’ve travelled the Internet and picked up postcards which show the town as Howard must have known it—these are the coolest items and are becoming increasingly hard to find. I even purchased a little wooden temperature gauge that proudly declares it comes from this Texan town—it no longer works but that really doesn’t matter. To show the depth of my obsession I’ve even bought some old pencils that advertise Cross Plains. Pencils, for God’s sake. 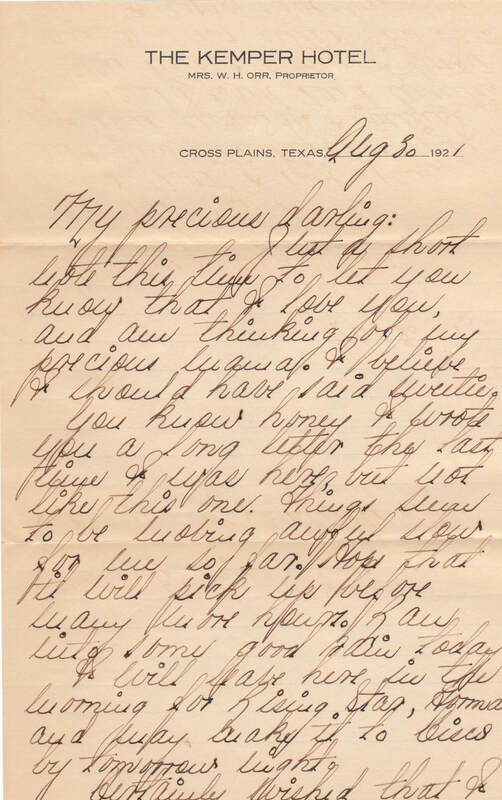 The latest item I picked up is a packet of letters written by a traveling salesman to his wife. These epistles are all from the year 1921 and are pretty dry reading. The salesman keeps telling his “sweetie” how much he misses her and that business is bad—he was evidently working for Firestone and the money was not exactly being raked in. At this time of year, for all of you heading to Cross Plains, it’s too bad the Kemper Hotel is no longer taking reservations.